However, there is another abundant source of nitrogen all around us. The Earth's atmosphere is about 78 percent nitrogen, and the Pakrasi lab in the Department of Biology just engineered a bacterium that can make use of that atmospheric gas—a process known as "fixing" nitrogen—in a significant step toward engineering plants that can do the same. 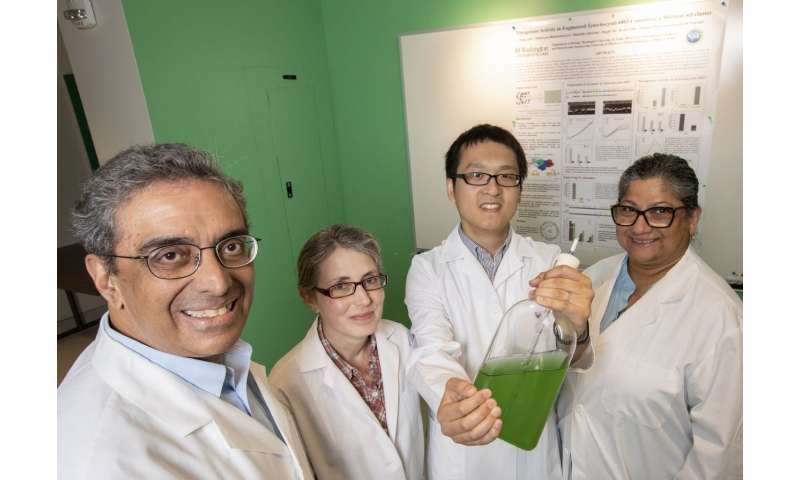 "Cyanobacteria are the only bacteria that have a circadian rhythm," Pakrasi said. Interestingly, Cyanothece photosynthesize during the day, converting sunlight to the chemical energy they use as fuel, and fix nitrogen at night, after removing most of the oxygen created during photosynthesis through respiration. To find the right sequence of genes, the team looked for the telltale circadian rhythm. "We saw a contiguous set of 35 genes that were doing things only at night," Pakrasi said, "and they were basically silent during the day." "This means that the engineering plan is feasible," Pakrasi said. "I must say, this achievement was beyond my expectation." Crops that can make use of nitrogen from the air will be most effective for subsistence farmers—about 800 million people worldwide, according to the World Bank—raising yields on a scale that is beneficial to a family or a town and freeing up time that was once spent manually spreading fertilizer. "If it's a success," Bhattacharyya-Pakrasi said, "it will be a significant change in agriculture."